Refined details and casual elegance best describe this pub-style table with slightly flared legs. With a deep, rich walnut finish, the round table is an ideal size for a cozy dinner, working on your laptop or playing a game of cards. 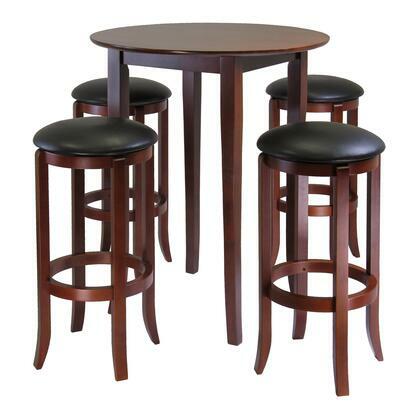 The 5-piece set comes with four, round swivel barstools. The barstools have a heavy-duty ball bearing swivel and a black faux-leather PVC upholstered cushion. This versatile set will look stunning in your kitchen, breakfast area or family room.